Speaking of convenience, these North Myrtle Beach rentals are brimming with conveniences and amenities. The kitchen in the Beach Club III condos is well equipped with full-size appliances. Use the full-size refrigerator to keep your soft drinks and juice cold and take advantage of the dishwasher to help you with the dishes so you can go swim or play on the beach. There is even a breakfast bar that is ideal for serving cereal and snacks during your North Myrtle Beach vacation. The high-speed Internet access can prove to be quite useful. Bring your laptop computer and get online to take a look at the Myrtle Beach golf courses, store hours for nearby shops, restaurant menus and show times of the live entertainment theatres. Having Internet access can really assist families in planning their North Myrtle Beach vacation days. There are numerous televisions and at least one DVD player in these North Myrtle Beach rentals. First thing in the morning when you want to enjoy a cup of coffee on the oceanfront balcony, the kids can slowly wake up and watch cartoons. Your family can spread out in these North Myrtle Beach condo rentals so that everyone can watch their favorite shows without interrupting others. The three or four private bedrooms in each of these condos in North Myrtle Beach, SC are nicely decorated and quite comfortable. Most of these North Myrtle Beach rentals also have a sleeper sofa in the living room. There are accommodations for eight or 10 people in all of these North Myrtle Beach rentals. The master suite beautifully opens up to the oceanfront balcony so you can sleep with the sliding glass door opened just enough that you can hear the sound of the crashing waves right outside your North Myrtle Beach condominium. For your leisure these North Myrtle Beach rentals have a soothing Jacuzzi tub. Lounge lazily in a hot Jacuzzi bath and let the bubbles and the jets ease all of your aching muscles. These non-smoking North Myrtle Beach condo rentals also have a washing machine and clothes dryer which are so convenient during a family beach vacation. When you plan a North Myrtle Beach vacation that begins with reservations for a condo at Beach Club III in North Myrtle Beach, SC you are setting yourself up for a fantastic vacation experience. This North Myrtle Beach resort is closely located to everything as you will quickly see. Not only is it conveniently located and easy to find from Highway 17, this North Myrtle Beach resort is right down the beach from the very popular Cherry Grove Fishing Pier and right around the corner from the well-liked Barefoot Landing, where shopping, dining, House of Blues and Alabama Theatre are found. Water sports in the area include tandem parasailing that puts you at eye level with the pelicans while soaring over top of the Atlantic Ocean. A banana boat ride can take the whole family at one time where you will all bounce over the waves. Rent Sea Doos and explore the inlets or venture out to the Atlantic Ocean for a memorable ride. Marinas with deep-sea fishing charters, head boats and boat rentals are found throughout North Myrtle Beach, SC so getting in some fishing is easily accomplished. Shop until you drop in the North Myrtle Beach area. A pair of outlet malls makes the bargain hunting that much more fun and a number of antique stores ensure you that one-of-a-kind piece. Barefoot Landing is situated along the Intracoastal Waterway and is home to shopping, dining, House of Blues and Alabama Theatre. You can make a day and an evening of it during your North Myrtle Beach vacation when you visit Barefoot Landing. There are more live entertainment theatres around town than just at Barefoot Landing. See a show at the Carolina Opry, Legends in Concert or Palace Theatre. Dinner theatres in the Myrtle Beach area include Medieval Times and Pirates Voyage. All of these shows are family-friendly and most are filled with music and dancing. When you enjoy a North Myrtle Beach vacation at Beach Club III you will be surrounded by seafood restaurants. Dine on succulent oysters, fresh fish, fried shrimp and homemade chowders. Whether you want something casual or a more upscale dining experience, North Myrtle Beach, SC has you covered. 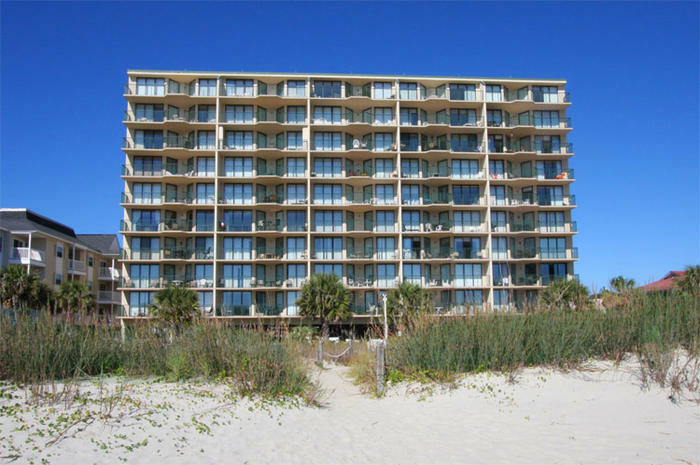 Elliott Beach Rentals is not affiliated with onsite management or the HOA of Beach Club Iii.